I moved to Greenville from Chicago in 2005 and have not for a minute looked back. I enjoy cycling, hiking, real estate and meeting new people. This endeavor fits my passions perfectly and I look forward to running this inn and showing visitors how to get the most out of their stay in Greenville and help guide those considering a move here. Please email me with questions if you are also thinking of relocating like I did 10 years ago. I am a licensed real estate agent. The location can't be beat! Right in the heart of downtown Greenville. Two blocks from Main Street and two blocks from the Swamp Rabbit Trail. The Swamp Rabbit Trail is right out the front door and downtown Greenville is right out the back door. You can literally park your car in our lot and walk or bike to everything in the area if you choose. There is so much surrounding the inn. Rent the whole house for family gatherings, weddings, girl's weekends, retreats or just a room and mingle with the other guests. The entire inn is decorated with IKEA and has a fun, funky feel. First and second floor have hall bathrooms shared by two guest rooms each and two rooms on the second floor have a private bathroom with shower stall, sink and toilet. All rooms have a sink and a mirror. Close to everything downtown Greenville has to offer. Walk to restaurants, bars, shops, Falls Park, Flour Field and a block off the Swamp Rabbit Trail. Upper and lower deck. Lower deck has a bar. This property is a great hotel alternative for business groups, artists, performers and teams traveling together who want a home environment where they can have meetings in the common areas and cook their own meals. We are two blocks from Main Street in downtown Greenville and two blocks from the Swamp Rabbit Trail. We have Apple TV and a big screen tv for presentations, white boards and chalk walls in common are for meetings. We have 8 bikes available for rent. All positive things to say about this rental. The house is adorable and the location is amazing. You can walk to Main Street where there are restaurants and shops. A group of us rented out the whole house to run a race. Rooms were comfortable and kitchen is huge. They had some snacks for us, coffee pots and now bathrooms in each room. They thought of everything. I would recommend this place to anyone and will absolutely rent this place again next time I’m in Greenville! We loved every minute of it!! Couldn’t have been more comfortable. So much attention to details. Perfect location. Hope to return. Thank you Wendy! My family recently rented the whole house to attend my sons wedding. There were twelve adults and two children under the age of four. The 6 bedrooms accommodated everyone and the kitchen, dining, living space is large enough for all of us to be in the space together. There are great outdoor spaces too. We loved the location so close to Falls Park and we were 1 1/2 blocks from the Old Cigar Warehouse where my son got married. Just an all around wonderful experience. I had my whole family from out of town stay at the Swamp Rabbit Inn and the space was perfect for spending time together and private washrooms made it easy to get ready for the big day without fighting over the washrooms. A perfect property for a family gathering. We had a great weekend here for a family wedding. The house accommodated 14 adults well with no crowding. More so, the house is presented by a host who is clearly generous of heart and who has successfully created a very enjoyable atmosphere. An amazing property, location, experience! We have been renting houses for our extended family of 11 for the past 7 years at Christmas. This one was by far the best! The location and proximity to downtown was perfect. Wendy stocks the house better than any I’ve ever seen, including K cups, laundry supplies, some food and even a pancake griddle. The rooms are large and adequately stocked with towels and toiletries. Wendy is accessible the entire time and could not have been easier to work with. I’m a little sad that my family likes to rotate cities every year because I will forever compare properties to this one (yet I don’t think any will beat this one)! Thank you for a wonderful week that I will remember forever! This makes my day!! I am so happy your family had an amazing experience at the Swamp Rabbit Inn. It was great to work with you and hope you will be back to visit again! Thank you Brittany for nice a nice review!! Two blocks from Main Street in downtown Greenville, this 6 bedroom house furnished entirely in IKEA is perfect for large groups of business travelers, wedding goers, friends and family to gather and enjoy everything Greenville has to offer right out the front door. Whether traveling for business or pleasure, park your car in our large parking lot (7 spaces) and explore downtown Greenville on two wheels or two feet. Convenient to everything. Walk to restaurants, bars, shops, Falls Park, Flour Field and hop on one of our rental bikes or bring your own bike and discover why Greenville was recently ranked one of the top ten bike cities in the United States. Great for running, walking or biking, the Swamp Rabbit Trail is right out our front door. 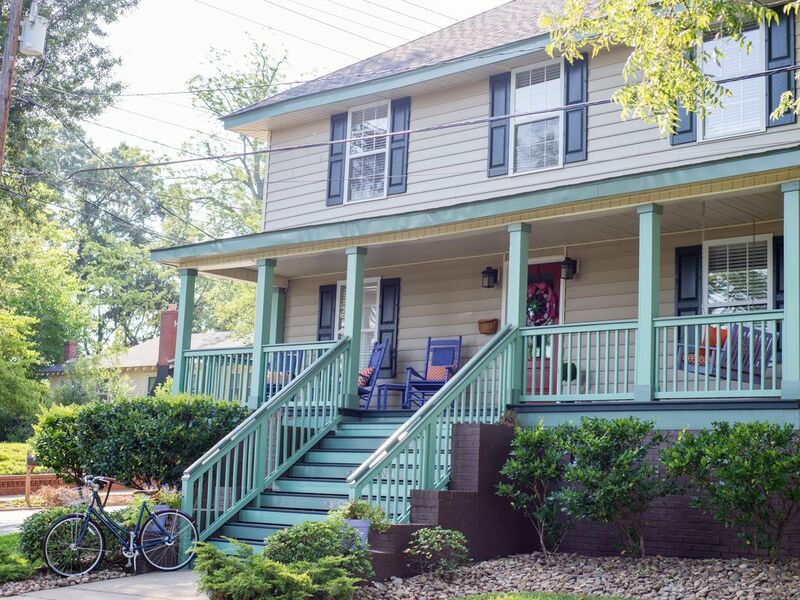 Community kitchen and beautiful outdoor decks with a gas grill and rocking chair front porch make this a cozy place to crash while staying in downtown Greenville. Thinking about relocating to Greenville? We can help you with that too! The owner is a licensed real estate agent and real estate investor. Live like a local while you check out the local real estate market downtown and in surrounding areas like Travelers Rest, Simpsonville, Greer, Taylors and Easley. We are close to many popular wedding venues in downtown Greenville and great for wedding parties or out-of-town guests. One block from The Old Cigar Warehouse, Zen, and walking distance to the Certus Loft, Peace Center, Wyche Pavillion, Westin Poinsett, and beautiful Falls Park on the Reedy River. In town for the big game? We are great for alumni gatherings, Homecoming, Parent's Weekend or Graduation. Close to Clemson (20 miles) and Furman University (7 miles). We rent bikes at the rate of $25/day. Please message us if you would like to rent bikes (number of bikes and number of days you would like to rent) and we will deliver to the property on the dates you would like and add to your bill. We provide helmets and locks. Please message us with any questions. Rates are subject to change until reservation is confirmed.